I’m weary of New Year’s Eve prix fixe dinners. Visions of assembly line steaks and rubbery fish give me the shivers. But, we did our homework and sifted through some of the finest restaurants to bring you this list of unique top-notch dining and foodie experiences to ring in 2016 in Seattle. We plan to keep adding to this list over the next two weeks, so be sure to check back. Whether you want oysters and caviar or go straight for the sweets, you’ll find what you’re looking for - always accompanied by bubbly. Only care about bubbly? Check in with the folks at Ballard’s Stoneburner, who confirmed at press time that they’re ringing in the new year with their famous Champagne flights again. Chop Shop, Capitol Hill: Owner Ericka Burke is planning a Roman-style Bacchanalia complete with jugglers, suckling pig and massive amounts of wine. The entire restaurant will be done up as a palatial dining room brimming with family-style platters of antipasti, bread and cheese followed by main courses. There will be grape clusters, too, we just can’t promise servants feeding them to you. $250/person. Reservations: 206-535-8541. Staple & Fancy, Ballard: All of E-Stow’s 10 restaurants have menus planned, but this one stood out for its four-course supper that begins with fois gras terrine, scallop crudo, parsnip soup or braised pork belly. From there options include ravioli, paccheri, lobster risotto or tagliarini with black truffles (extra $20). For mains, seared sea scallops, braised rabbit or a Snake River zabuton steak. Yeah. Thought you’d like that. $80/person. Reservations: 206-789-1200. Canon, Seattle: When you've made Conde Nast Traveler's 30 Greatest Bars in the World list, there isn't much room for going up. Actually, this New Year's Eve dinner might fit the bill: an intimate, six-course menu including smoked Alaskan king salmon, sheep cheese custard with a drink pairing called Miss Piggy Takes Fighattan, and a lollipop dessert trio. The only thing left to do is email your requested seating time (5:00-6:30 p.m. for $105 per person, or 8:00-9:30 p.m. for $130) and number of guests in your party to drink@canonSeattle.com. El Gaucho, Seattle: One of our favorite steakhouses is celebrating with a Prohibition-era cabaret in their Pampas Room. Dinner includes burlesque entertainment and your choice of steak, of course: filet mignon, New York, rib chop, fresh fish or truffle risotto. Choose between two shows/seatings: three courses at 5 p.m. for $150 or four courses at 9 p.m. for $185. Bar seating available for less. Check the website for details and reservations. Palladian Hotel, Belltown: Does kale juice go with caviar? It does if you’re counting down at this New Year’s Eve celebration, which takes place on three levels, each themed for a different city and celebrating on that time zone. New York starts at 9 p.m. PST with complimentary hors d’oeuvres and caviar service; Chicago (aka Pennyroyal Bar) will offer street food and craft cocktails; and, finally, in the Seattle room, you’ll get brandy, sweet treats and healthy juices. Each level has a Champagne toast when the city strikes midnight. $50 ($75 after Dec. 20) for access to all. Go here for tickets. Trellis, Kirkland: I recently re-experienced executive chef Brian Scheehser’s cuisine in a food and wine competition and was blown away. The James Beard-nominated chef is planning a five-course dinner featuring the classics: Maine lobster bisque, Champagne sorbet, filet mignon and pecan pie. Just think - if you don’t finish your sorbet or lose your spoon you can just drink it when the clock strikes 12. $95/person. Reservations: 425-284-5900. Monsoon, Capitol Hill: This modern Vietnamese restaurant consistently offers a lovely NYE experience with great food and good value. 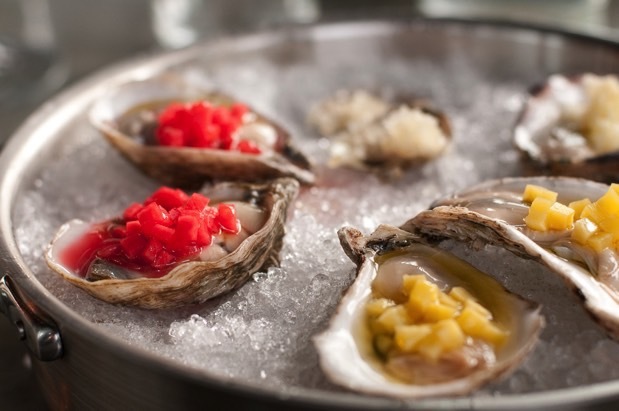 In addition to their dynamite regular menu, they’ll be featuring oysters (raw Kumamotos and grilled Shigokus), pink grapefruit and crispy taro salad, lobster congee (hello! ), grilled lemongrass Anderson Ranch lamb chops and Braised Heritage Meats grass-fed ossobucco with taro mash. For details (including price) and reservations, call 206-325-2111. Hot Cakes, Capitol Hill and Ballard: If your priorities are sweets and alcohol (whose isn’t?) you can count on pastry chef Autumn Martin to deliver. Both locations will have specials on bubbles and signature cocktails and boozy shakes all night. In Capitol Hill, look for $6 glasses of Prosecco or sparkling pomegranate punch. In Ballard, it’ll be honey-themed “Save the Bees” Champagne cocktails and Prosecco too. I can practically taste the smoked chocolate pudding now. Information: 206-258-2591.